The Peace silver dollar was first minted in 1921 in accordance with the Pittman Act of 1918. Sculptor Anthony de Francisci won a contest held by the United States Mint to design the new silver dollar coin. The new coin design was to commemorate peace and the end of hostilities after the "Great War" (World War I). Unfortunately, dies for the new Peace design were not ready. In order to start producing silver dollars to meet the requirements of the Pittman Act, the U.S. Mint revived the Morgan silver dollar design and produced millions of 1921 dated Morgan dollars during the first part of the year. It wasn't till later in the year that the first peace dollars were produced in 1921. The new Peace silver dollars minted in 1921 were struck in high relief motif. This caused problems getting the coin to strike up properly and to show all the details of the intricate design. In 1922 the relief was lowered to solve these minting problems. Therefore, most Peace Dollars minted in 1921 are lightly struck at the center of the obverse (hair above the ear) and on the center of the reverse (feathers on eagle's wings). Additionally, many coins were struck from dies that were worn out and this resulted in a grainy appearance in the fields. When purchasing uncirculated Peace silver dollar coins look for well-struck examples that were not struck from worn dies. The details should be sharp and the fields should be smooth. All dates and mintmarks are readily available. The key date is the 1928 coin minted in Philadelphia in circulated grades and the 1934 San Francisco minted in uncirculated grades. Since many of these coins ended up in storage at the U.S. Treasury Department and were moved frequently, many uncirculated examples are heavily bag marked. Unmarked coins that are well-struck command premium prices at auctions. Beginning coin collectors usually start by acquiring a single example of a Peace silver dollar for their type collection. Since there are no major rarities and only two key date coins, any other date and mintmark combination will be of reasonable value. 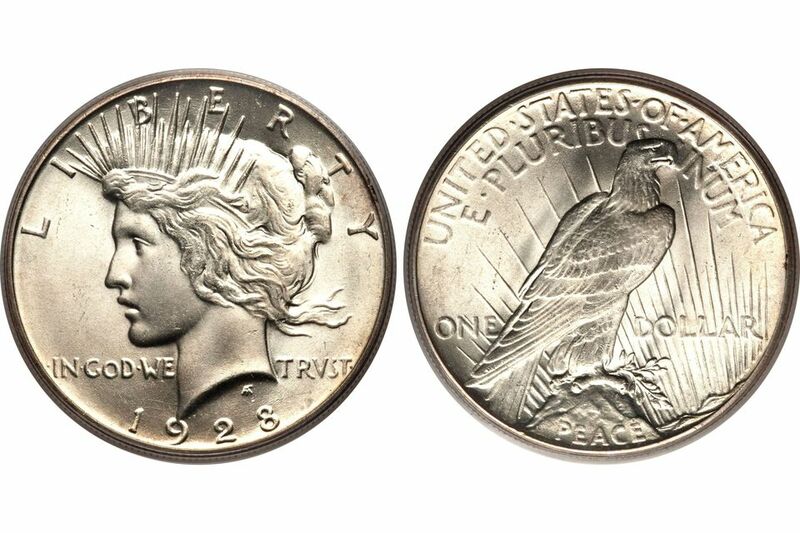 Since the design was modified (lower relief) in 1922, some collectors consider the 1921 Peace silver dollar a subtype and collect one high relief (1921) and one low relief (1922 through 1935). A circulated example of the 1921 high relief coin can be purchased for under $100. A nice 1921 uncirculated coin without any problems will cost between $300 and $400. Other dates, with the exception of the two key date coins, will cost between $30 and $35 for a circulated example. You can acquire an uncirculated example for between $40 and $45 (for example 1922, 1923, 1924 or 1925 can be obtained for a reasonable price). A beginning collector with a larger budget or an intermediate collector will find adequate enjoyment in assembling a date set of Peace silver dollars. A complete date set will consist of only ten coins. A set of circulated coins can be assembled for around $350, while an uncirculated set will cost approximately $1,400. This unexpectedly low price for the set of circulated silver dollars is achieved by avoiding the 1928 Philadelphia minted coin and purchasing a 1928-S (San Francisco minted) Peace dollar. The intermediate collector will want to assemble a nicely matched set of circulated Peace silver dollars that grade extra fine (EF-40) for their date and mint set. Collecting one coin from each date and mint throughout the entire run will be a challenging yet doable task. You should be able to bring this set together for around $1,000. The more advanced collector with a larger budget will strive to assemble an uncirculated set. The key date for uncirculated peace dollars is the 1934-S San Francisco minted coin that will cost around $3,000 by itself. You should be able to assemble an entire uncirculated date and mint set for around $7,000. The advanced coin collector will want to include the popular 1934 Denver minted doubled die obverse variety. Proof coins were minted in 1921 and 1922 at the Philadelphia mint using both the high and low relief dies, in both satin in matte proof finishes. Most of the coins were melted at the mint and never reached collectors. However, a few of them escaped the Mint and now cost between $50,000 and $100,000 each. Advanced coin collectors that specialize in collecting Peace silver dollars will collect them by VAM. VAM attribution of Peace silver dollars involves studying the minute details of each coin. Each month new die pairings and die states are discovered. Researchers publish their discoveries on the VAM World Web Page. Many factors go into determining the price and value of a coin. As a coin collector, you must develop your coin grading skills to assess an accurate appraisal of your coins. Also, you will directly benefit from learning as much information as you can about the Peace Silver Dollars coins. This includes such things as mintages, die varieties and detailed specifications.